Situated a few kilometres outside Beaufort West and abutting the N1 highway towards Laingsburg, the Karoo National Park is one of the most accessible national parks in South Africa. The Park straddles the mountain slopes and high peaks of the Nuweveld Mountains which stand sentinel over the vast surrounding plains of the Koup. Approximately 63 species of mammals and 200 species of birdlife can be seen in the park and it is an important refuge for the highly endangered riverine rabbit endemic to the dry river courses of the Great Karoo. The Karoo National Park had its origins as far back as the 1950s when local farmer William Quinton was active in promoting the idea of a conservation area in the Beaufort West area. His enthusiasm was rooted in the fact that in centuries past the Karoo was home to millions of plains game, especially vast herds of springbok, which had almost disappeared in the preceding one hundred years. The stories of millions of trekbokke, or migrating antelope, in the early nineteenth century passing through Beaufort West evoked images of a Karoo that had changed out of all recognition. The establishment of the Karoo National Park in 1979 was an important milestone in preserving at least a small portion of the Nama Karoo Biome that had all but disappeared after centuries of stock farming across the length and breadth of the Great Karoo. Accessibility of this new National Park was further enhanced with the opening of the magnificently situated Rest Camp facing the high ramparts of the Nuweveld Mountains. Download a detailed map of the Rest Camp. In addition to the highly endangered Riverine Rabbit, the Park is home to the endemic Cape Mountain Zebra and a variety of highly adapted species to the harsh, arid conditions including Aardwolf, Caracal, Bat-eared Fox, Cape Fox, Suricate and Aardvark, Red Hartebeest, Eland and Black Wildebeest amongst others. The Rest Camp was recently fenced-in with the re-introduction of Lion into the reserve together with the highly endangered and secretive Black Rhino. The Karoo National Park has been expanded over the years to approximately 90,000-hectares and encompasses a broad swathe of mountains, valleys and open plains. The access road from the main gate to the Rest Camp is surfaced however all other roads in the reserve are gravel with the principle loop road providing access to conventional motor vehicles to the spectacular Klipspringer Mountain Pass and beyond via the Doornhoek Picnic site via the 45-kilometre Potlekkertjie Loop encompassing all the principle environments within the Park. The shorter loop road links the Rest Camp with Lammertjiesleegte and the well-appointed Bulkraal Picnic Site which includes a sparkling swimming pool, an ideal respite on a sizzling hot summer day. One of the big attractions of the Karoo National Park is the Fossil Trail, laid out in the environs of the Rest Camp, which provides a rich insight to the geological history of the Karoo and its long extinct animal species dating back some 300-million years. 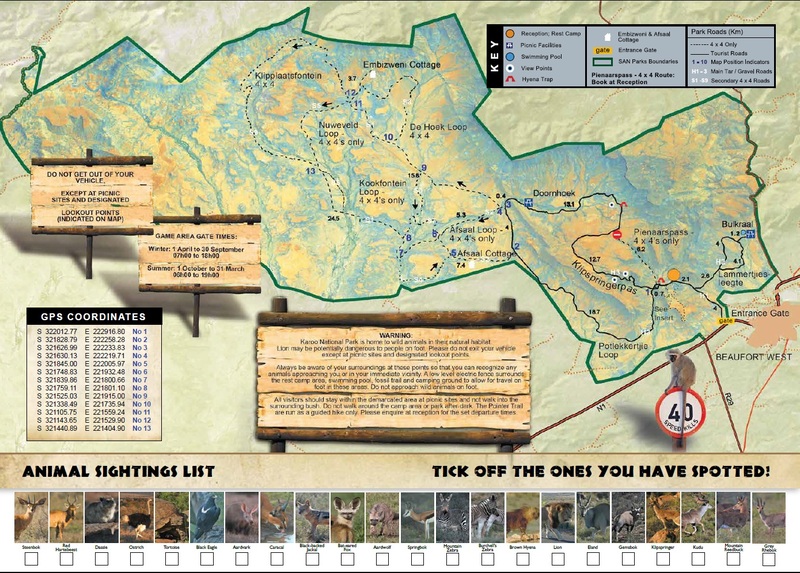 Download a detailed map of the reserve. In the remote western section of the Park a network of 4X4 trails provides access to visitors seeking a wilderness experience in spectacular semi-desert and mountainous terrain. This section of the Park provides basic accommodation in two isolated cottages for those seeking complete peace and solitude. Despite its accessibility to Beaufort West and the busy N1 highway the Karoo National Park is a haven of peace and tranquillity that invites the jaded city dweller to experience a glimpse of the Karoo that existed before the arrival of European settlers and the resultant transformation of the forbidding Karoo environment into one of the most important stock farming regions in South Africa. The Park provides the discerning visitor with the opportunity to discover the fragile, harsh, unrelenting yet hauntingly beautiful Karoo that has survived for millennia. The vast numbers of trekbokke, or nomadic antelope, are gone forever. However, with the expansion of this Park across a broad swathe of the Central Karoo one can still get a sense of the majesty and uniqueness of this beautiful place in the midst of mountains, valleys and sweeping plains.